Hello - It's already 2Nov2013. Time is flying by as well as the proverbial winds here on the North Sea Coastline. Elder Brindley is about 7ft tall, so he and I (Br Porter) attacked the glass cleaning from above. Good time for Windex, but it took a bunch of elbow grease as well as a couple of large bottles of glass cleaner with some ammonia in order to send the algae elsewhere. Actually, we all get along fine and the missionaries are welcomed in the branch with high hopes of great success. Sister Porter and I also came back the following Saturday after the Wed glass cleaning, etc. and cleaned up a TON of leaves to try and have the walkways and the lawn fairly clear of all the leaves under foot that basically stay wet and get a bit slick. We were 6 large landscape bags successful. However, there was a heavy wind that night and when we arrived for Sunday services there were bountiful leaves to greet us. We heard a couple of members complain how unsightly all those leaves are and that "we" should do something about it. Well - in fact there have been about 5 members who have cleaned leaves for this coming Sunday (Nov 3rd - tomorrow) and we got with them with our car and with 3 cars loaded with bags and bags of leaves, we took them to the city "dump" for leaves and lightened our loads considerably. The shed int he back is empty of all bags except the empty ones we will use in the future. We also took a 'business trip' to Jever, which is part of our Ward/Branch boundaries to visit some members who have not been coming to church. One single mother has a son who is 21 and a daughter who is 18. As we are working on the YSA and Youth of the Branch in an effort to get them active in something that is not yet there, we headed for Jever with the idea if we build it, they will come:-) On the right (above) is Sister Porter showing some of her skills learned while living in this area - how to stick a leaf on your nose! Do I have something on my lip???? Nope - it's on your nose! 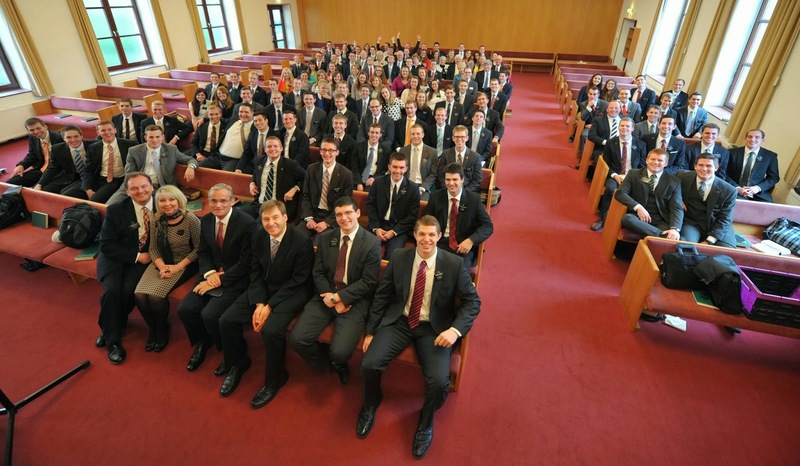 This last week we took the Elders with us in our car and drove to Hamburg for a "Mission Tour" meeting with Elder Patrick Kearon (Area 70 from the UK) and Elder Christian Pfingerle (Area CES Director) - who is also a cousin to Pamela Hartzheim Pfingerle's husband. It was a very good meeting with much learning and strength in the gospel effort shown and demonstrated while we were there. Hamburg was a full day, including 3 hours driving one way - we got back fine and then went looking for a member family who are about 43Km north from us in WHV. The husband fulfilled a mission to South Africa a few years ago, and we wish to know they are doing well and what we might be able to do to help them maintain their gospel growth and development. It is always nice to come home on a rainy day and see our neighborhood windmill to mark our way. This windmill and one other one in our area are far more fun to look at and watch run than the modern wind energy generators that are all over and remind me of aliens who have invaded the earth in a sci-fi movie. We hope all is well with every one. We are seeing some exciting changes taking place and it is very gratifying to know that we have something to do with positive direction of efforts and church growth. Sister Porter has been working hard in an effort to export Primary into the homes of members who have primary age children, but who do not attend church -- YET! She is also working closely with others to develop a Young Women/Young Men progress program.. This is beginning to take shape and reality appears as if it is very possible. Then there are the Young Single Adults (JAE here). We are working with Elder and Sister Paul who oversee Institute activities and our supplies have been ordered as a result of efforts to get folks out to church. 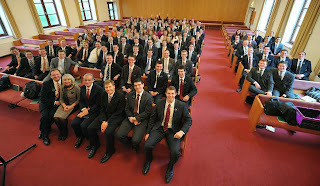 This last Sunday, Elder and Sister Paul attended our branch and met a number of the YSA.JAE members. They were very excited at the possib ilities - hence the ordering of the materials with full intent of starting an official institute program here in WHV. I guess one can say we are staying busy and enjoying these opportunities. It is a very good feeling to see what working together with members and people in this area in a common effort to make things better. They have ideas - we have ideas, and we work on what seems to be the best ideas to focus on.